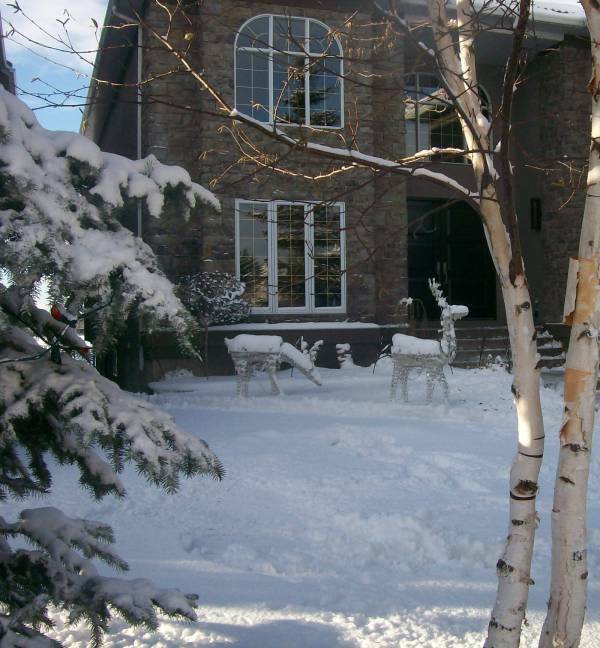 Welcome to our photo gallery on winter landscape ideas. We call this "Winterscaping". You will also find a seasonal flair to this section with some outdoor decorating ideas for Christmas. blanket of snow in the winter. We call this "Christmascaping". 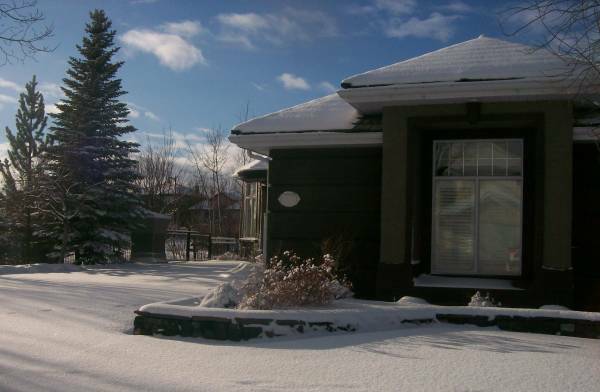 For those living in northern climates, or people that have never seen winter snow pictures, we hope you enjoy this gallery. The idea behind our winter landscape pictures gallery, is to show people how features look during the long winter months. It may also help with tree/shrub selection when considering sun/shade. On the seasonal side, we hope to help with your outdoor Christmas decorating. 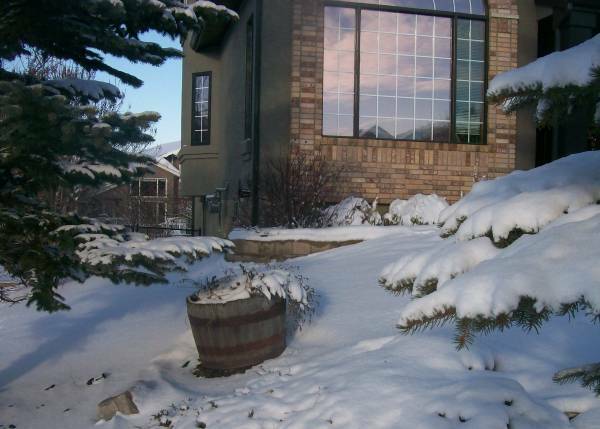 Many of us really don't consider what our yards look like in the winter, and design everything towards a 4 to 8 month growing season. A true dream yard should have interest ALL year long. 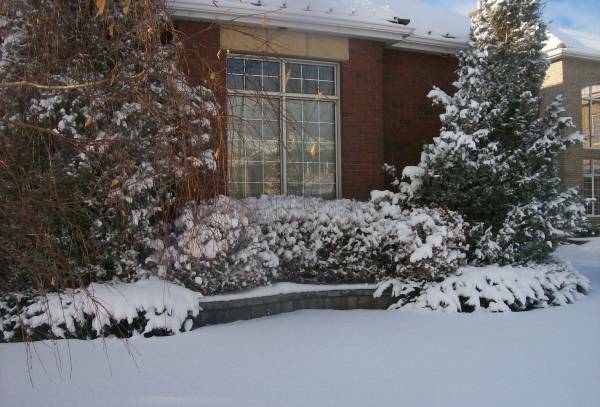 These pictures of winter landscapes will hopefully give you some inspiration at the design stage, so you can enjoy your yard year round. Just click on any image to open a winter landscape gallery slideshow. Hanging wreaths are one of the easiest and simple decorations to install. 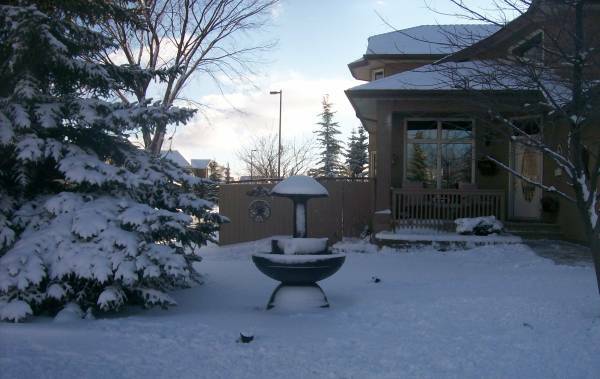 Traditional outdoor Christmas ideas like this are great for daylight hours. 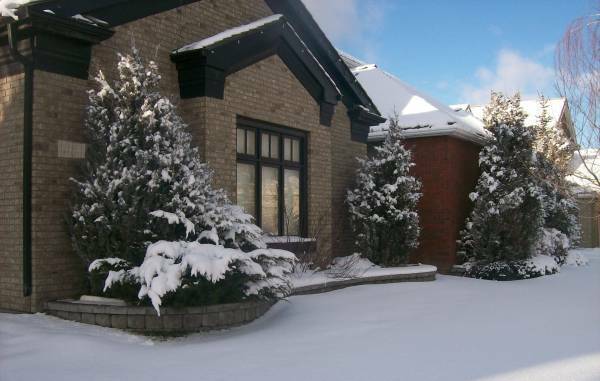 Working with evergreen and spruce trees around the front entrance of a home, is a great way to provide privacy and shade year round. 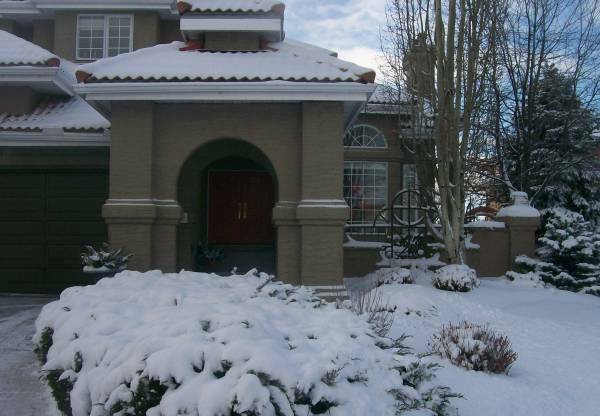 This is helpful winterscaping information for do-it-yourself homeowners in the planning stages. Outdoor Christmas lights hanging from the eaves provides night time enjoyment, while Christmas wreaths provide a warm welcome in daylight. 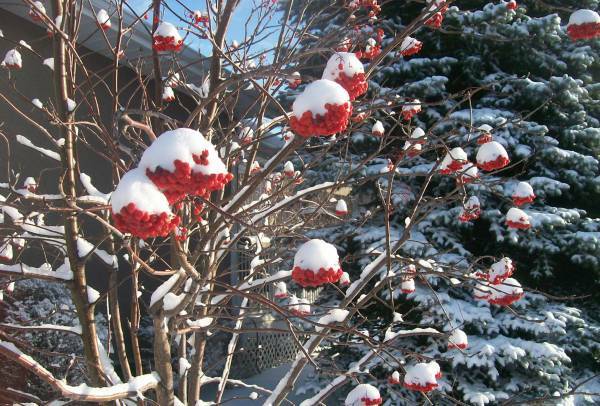 The snow covered shrubs provide year round interest in the garden. A fountain makes a nice feature in the summer, with soothing sounds from splashing water. 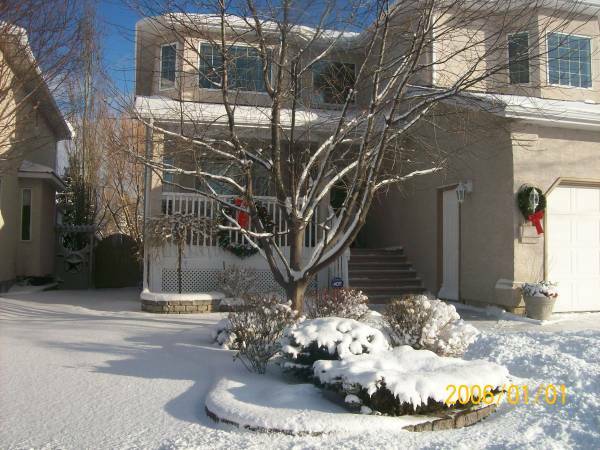 It decorates a yard like an abstract sculpture in the winter. 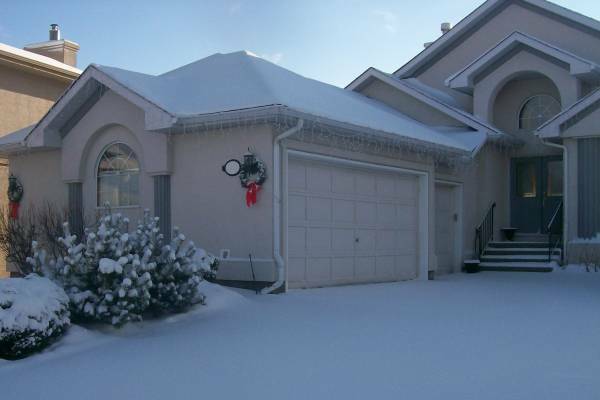 snowfall brings the Christmas season to life. 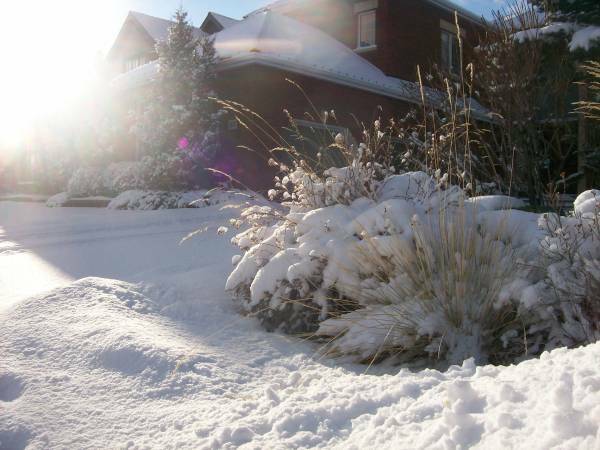 A well designed garden can look good in winter too. Balance is one of the most important aspects of landscape design. Although it may eventually be buried, this low brick wall also makes a nice year round feature. Another low brick wall with evergreens to provide year round interest. Adding shrubs and trees gives height to a design, and softens walls like this. Small stone retaining walls contain garden beds in the summer. In the winter, they break up the yard by providing nice lines with contour. for you when you are in the design stage. A simple barrel that holds colourful plants in the summer, becomes the feature through the winter months. 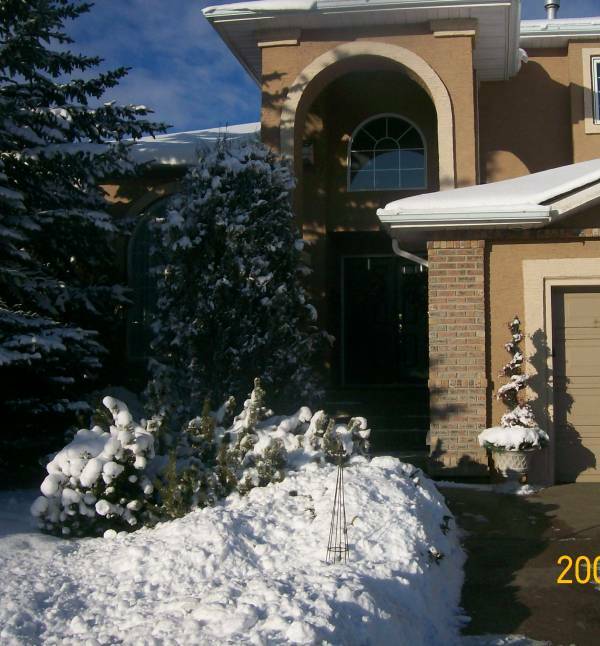 The low brick retaining wall wraps around the corner of the house supporting the snow covered shrubs. gone, the sun shines through to provide warmth.